Has Rihanna been taking style advice from a Disney villain? | HELLO! April 06, 2018 - 19:25 BST Leanne Bayley Who’d have thought it, hey? 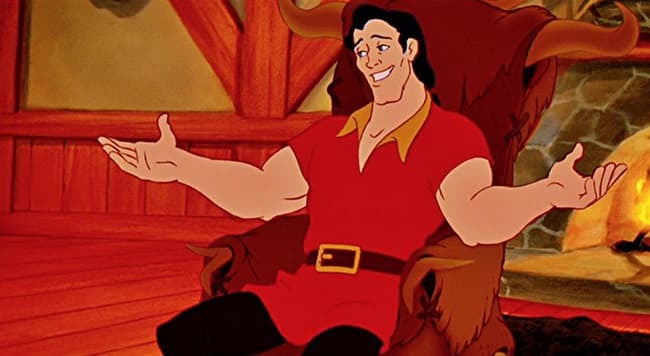 Rihanna taking style notes from Gaston in Beauty and The Beast. Confused? Look at her belt. Who’d have thought it, hey? Rihanna taking style notes from Gaston in Beauty and The Beast. Confused? Look at her belt. The singer slash actress slash designer slash beauty mogul has decided that Gaston’s favourite belt is her look du jour right now. For an event on Thursday evening, the 30-year-old donned a little black dress which she accessorized with a huge buckled belt. Very Gaston-esque, don’t you think? Or Santa, come to think of it. Regardless, the Baroque belt is huge in size – but will it become a huge trend now that Rihanna has worn it? We suspect so. Sorry ladies but it’s time to put your little Gucci belt away - for a little while, anyway. The event was held in Milan and it was to celebrate the launch of Rihanna’s latest Fenty Beauty line. RiRi chose a tight leather dress which showed off her killer body. She teamed the belted Versace frock with lots of bangles, glam gold shoes and bronze makeup. The look was first spotted on the Versace AW19 catwalk during Milan Fashion Week and she’s not the first star to wear the dramatic belt. Model Rosie Huntington-Whiteley also went hell for leather in a pair of shiny Zeynep Arcay trousers which she teamed with a Magda Butrym blazer teamed with a, yep, you’ve guessed it, Gaston-style belt. Can Rosie Huntington-Whiteley ever do anything wrong? Of course it’s not the first time Rihanna has stepped out in an OTT belt – she went one step further with a huge red belt with a gigantic buckle. Subtle, it was not. You too can recreate this look by working one with a boxy blazer or your favourite trench coat. It looks like this season, you have to go big or you go home.